Rose Coschignano/Pipe Dream Photographer Junior catcher Sara Herskowitz hit her fifth home run of the season in Binghamton’s three-game series against Stony Brook. 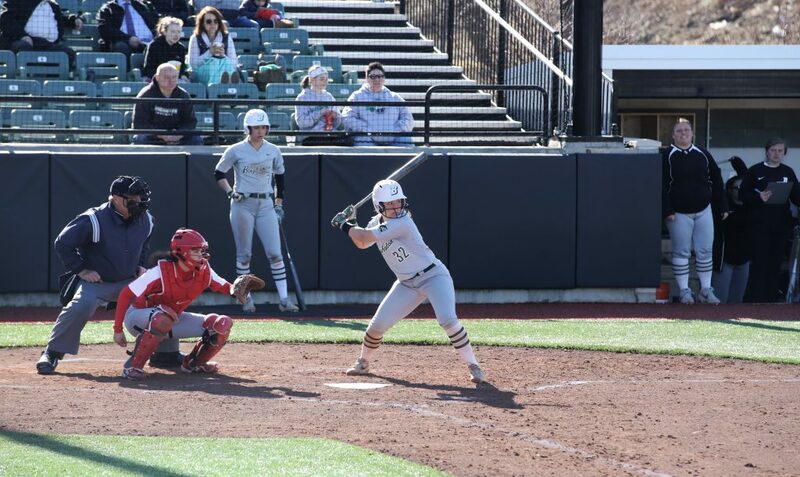 With a chance to climb back to the .500 mark in conference play, the Binghamton softball team traveled to Stony Brook this weekend to play a three-game series at University Field. The Bearcats (14-16, 3-3 America East) achieved that mark, winning two of the three games behind dominant pitching from junior Rayn Gibson. Gibson took control of the first game for Binghamton, leading the Bearcats to a 6-3 victory over the Seawolves (16-12, 3-3 AE). She went the distance and notched eight strikeouts while surrendering only one walk and eight hits. Only two of the three runs Gibson allowed were earned due to an error by sophomore third baseman Sarah Benn in the bottom of the seventh. The error let junior outfielder Alina Lance of Stony Brook reach base and later score on a double by classmate pitcher Melissa Rahrich. Though Rahrich was successful at the plate, going 4-for-4 with three RBIs, the pitcher was less effective from the mound. She earned the loss for Stony Brook, tossing 4.2 innings and giving up four runs (three earned), three hits and two walks while striking out five. It took a few innings for Binghamton’s offense to warm up in the game, as the team only plated one unearned run in the first four innings, but BU began to produce offensively later in the game. An RBI double from sophomore infielder Makayla Alvarez and a two-run homer off the bat of junior catcher Sara Herskowitz gave the Bearcats a 4-0 lead in the fifth. Herskowitz now leads the team with 21 RBIs. BU stretched its advantage the next inning with RBI singles from freshman second baseman Marissa Braito and junior outfielder Stephanie Ragusa. The nightcap of Saturday’s doubleheader featured much less offense from both sides, with Stony Brook claiming the 3-2 win by scoring all three of its runs in the third inning. The Seawolves were led by a complete-game performance from freshman pitcher Shelbi Denman (6-2). Denman gave up two runs on six hits while punching out six Bearcat batters. Binghamton scored in the second when Herskowitz reached home on Benn’s single and in the sixth when Alvarez smacked her third home run in the team’s past three games. Alvarez now leads the team with six long balls. BU’s comeback hopes began in the seventh when Benn recorded her second hit of the game, but ended when sophomore outfielder Lauren Martinez hit into a 5-4-3 double play. Sophomore pitcher Chelsea Howard (2-3) surrendered three runs on seven hits in three innings, earning the loss. Gibson (7-7) returned to the mound on Sunday and continued to stymie the Seawolves’ offense, throwing a four-hit shutout. Gibson and her 10 strikeouts led the Bearcats to a 1-0 victory. This marks her second career complete-game shutout and the third time she’s recorded 10 or more punch-outs. Her weekend totals include two wins, two complete games and 18 strikeouts against a team that led the AE in batting average (.311) entering the weekend. With the 10 strikeouts on Sunday, Gibson now has 233 in her career, which is good enough for sole possession of ninth place in Binghamton’s program history ranks. She overtakes Kristen Emerling, who recorded 221 strikeouts from 2009-12, down to 10th. The other half of the pitching duel, Rahrich, pitched almost as well as Gibson, but not well enough. Rahrich (7-9) also went the distance while striking out 10. The only blemish on her day was Alvarez’s RBI single that brought home Braito. Offense was so scarce on Sunday that the first hit of the game didn’t come until the fourth inning, when SBU junior outfielder Jourdin Hering doubled off Gibson. Benn collected Binghamton’s first hit an inning later. Next up for Binghamton is a doubleheader against Albany on Wednesday, April 10. First pitch is set for 2 p.m. from the Bearcats Sports Complex in Vestal, New York.